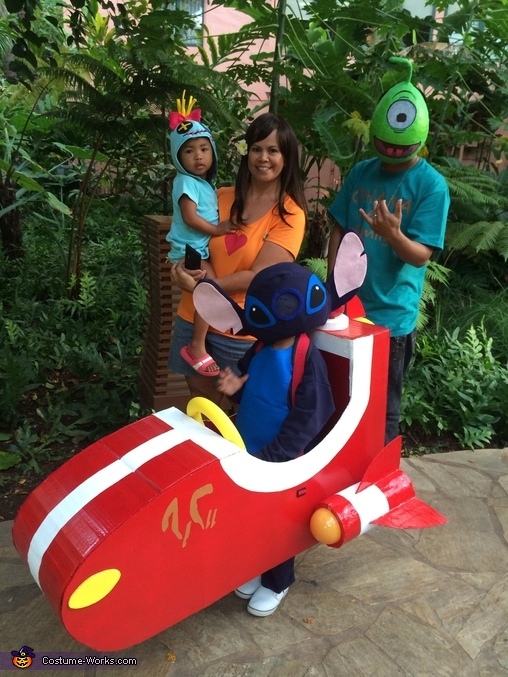 Our lilo and Stitch costume Theme came from my son. He loves the movie! Stitch: Stitch is worn by my son. Mask is made from paper mache and covered with the same material as his sweats and felt for the face. We used stitch's nose area for the place where my son could see through using a plastic screen. His sweats were bought from Walmart and stitched on felt for the character's body marks. His spaceship is made from card board that I cut, bent, and hot glued together. Used spray paint for the colors. Cut off strap from a back pack to use around his neck to carry the spaceship. Lilo (Red dress): I used an old red dress to make Lilo's costume. I cut out the leaf shape from white felt then stitched them on. Scrump (Lilo's Doll): Scrump is worn by my niece. I found a hoodie dress at Savers the. Decorated it like the scrump doll by stitching felt onto it. Pleakley (green mask): my husband is pleakley. The mask is made from paper mache. Used acrylic paint for the face. I used an old plain shirt to paint on the words "Ohana Means Family". Made a stencil with freezer paper then painted the words in with fabric paint. I mixed Textile medium and acrylic paint to make fabric paint. Nani (orange shirt): Worn by my mom. She has short hair so she decided to wear a wig to have long hair like Nani. We used a plain orange shirt and painted a heart on with fabric paint. Can you please post how to make the stitch paper mache mask step by step? Or if not, its okay. I was just asking because I am doing a paper mache mask of stitch for a school project and I have no idea how to start. I would appreciate it. Thank you.